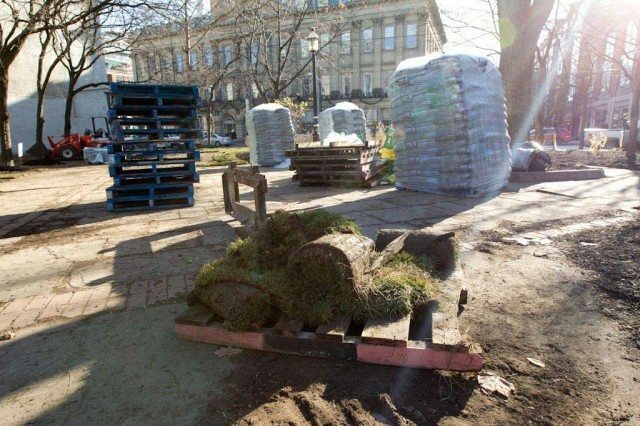 WHAT: One of the major arguments the City of Toronto made when it went to court to get permission to evict the Occupy Toronto camp from St. James Park was that they needed to prepare the park for winter. They also, once that eviction took place, needed to repair the damage caused by weeks of camping. Though there was some heated political rhetoric about the tens of thousands of dollars this would cost the good taxpayers of Toronto (free speech apparently being great so long as it doesn’t cost us anything), as it turns out it didn’t cost a dime: Landscape Ontario and the Nursery Sod Growers of Ontario donated both the sod (12 tractor trailers–worth) and the labour needed to lay it. That process was completed today, and by early afternoon the much-lamented dog-owners were back in the park, walking their pooches once more.